News Growing shrimp: choices for the environment have to be made. Growing shrimp: choices for the environment have to be made. For decades, growing shrimp has been a profitable but also risky business for farmers due to the risk of viral diseases that can sweep away complete crops. For the environment, the development of higher stocking densities, brought only negative effects due to the large amount of chemicals used in such systems. The combination of open systems with random water in and outlets and the use of difficult-to-control earthen ponds has led to large scale pollution of soil and water. The uncontrollable nature of this type of shrimp farming has also led to the frequent closure of troubled farms and the need to build new farms in coastal areas that otherwise have an important role as natural habitat for flora and fauna, such as mangrove forests. Over time large shrimp farm companies have introduced new technologies that allow for better water quality and shrimp health management, such as the use of liners in ponds. Real improvements such as water recycling are making their entrance. One thing that is becoming clear is that farmers need to make a choice: traditional shrimp farming at low stocking density or ‘industrial’ farming, isolated from the environment at higher stocking densities. Not much different from debates in livestock farming ! Even though traditional shrimp farming is not an environmentally viable alternative to supply the world demand for shrimp (the pond acreage would have to be increased tremendously at the cost of the environment) it does provide a sustainable income for small farmers that are able to supply the ‘organic’ market for shrimp at a premium price. The industrial farming concept is thus unavoidable to meet the world’s demand for shrimp. Closed systems both in terms of pond bottom as well as water recycling allow for near-perfect control of growing conditions, avoiding the risk of bringing in diseases. The principle of closed systems – which are never 100 % closed – make that large amounts of cheap bulk chemicals (lime, bleach) are no longer required and can be replaced by a more intelligent water control system based on small quantities of more expensive but also more effective and more environmentally friendly products. Halamid® and probiotics have proven a powerful duo to control water quality and avoid disease problems. Both Halamid® and probiotics are fully biodegradable with harmless residues that mineralise easily. At low concentrations, Halamid® is extremely effective in killing vibrio and other bacteria. Disinfectant efficacy is a combination of concentration and time. The secret of Halamid® is that it works for a prolonged period of time, thereby allowing lower concentrations and giving longer protection. The use of Halamid® in the water preparation is the best possible prevention of diseases coming in via de water or the stock. If needed, during the grow out phase Halamid® can be applied at large intervals to keep harmful vibrio under control thereby keeping immunity of shrimp against diseases at a high level. Antibiotics are banned in this type of farming. As with livestock, intensive rearing of shrimp does bring up the point of animal welfare. Proper farm management and reasonable stocking densities allow for good living conditions without diseases. The large world demand for shrimp does require sophisticated intensive farming techniques but in the method described above, this seems compatible with an acceptable level of animal welfare. 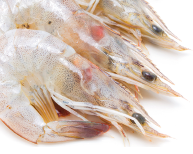 Halamid® plays an important role in the development of sustainable shrimp farming all over the world.